LiveCode LessonsLiveCode LessonsHow To - LiveCode Mobile Tasks iOS TasksHow do I use the Question and Password Dialogues in iOS? This lesson describes how to use the LiveCode Question and Password Dialogues in iOS. Source code and screen captures are provided. The Question and Password Dialogues provide simple pop up windows that allow you to prompt the user for the answer to a question or a password. The keyboard is raised at the same time as a dialogue is displayed. This allows the user to enter the required information. 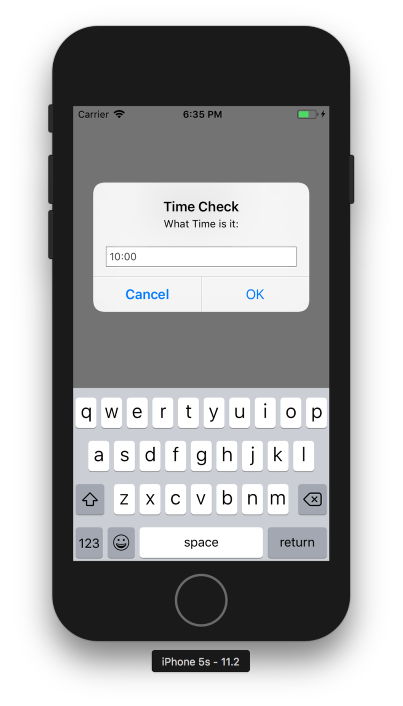 ask question "What Time is it:" with "10:00" titled "Time Check"
Observe how the respective areas of the dialogue are populated with the values specified in the ask command. Once the user enters an answer, the result is shown in solid black characters. The result is written to the variable it. ask password "Please log in:" with "Your Password" titled "System Password"
The respective dialogue areas are populated in the same way for the Question Dialogue as for the Password Dialogue. Once the user enters a password, black dots are displayed, indicating that characters have been entered. The result is written to the variable it. Next: How do I play sounds on an iOS device? It seems that the behavior works as described in the IOS Simulator, but not on other platforms, or in the IDE. The documentation indicates that the resulting value after an ask password ... session will be encrypted, so you don't actually know the value passed. This is true, except in IOS, the value passed in is what is placed in the 'it' variable. This can be confusing when building an IOS App, as the IDE will have a different behavior, but if you're aware of the difference, it's relatively trivial to work around. yes, thank you for pointing this behaviour out. The dictionary entry has been updated to reflect this difference. The default value when used on an iPad shows up as black dots/concealed and not "Your Password".